The Library Media Center is a state-of-the-art learning center designed to provide students with both the print and electronic resources necessary for their research. Students are encouraged to use the LMC before and after school as well as during the school day. Students are expected to work quietly in the library. Disruptive noise, headphones, cellphones, sleeping and card playing are not allowed. No food or drink is permitted in the LMC. All school rules, including the dress code, apply in the LMC during operating hours. With a current student ID, books from the general collection may be checked out for two weeks and renewed for an additional two weeks as long as no other student has requested the book. Date due cards are placed in the book pocket indicating when the book must be returned. Students are responsible for returning all materials on time. A fine of five cents per day per item will be charged for overdue materials. Students are also required to pay for any damaged or lost items. Students are responsible for LMC materials that they check out and are required to pay for damaged or lost items. Theft and mutilation of LMC materials, equipment, or furniture shall be regarded as a serious offense. Students need to obtain a library pass from a classroom teacher in order to use the LMC. Students should remain in the LMC until the period ends. Students who are either disruptive or repeatedly do not follow the library rules will not be allowed to get library passes. This lab is networked to the school’s main Computer Lab and, therefore, students will need to use their login name and password to use the computers. The Library Catalog is available on all computers in the school. Using this catalog, students may search for library materials by author, title, subject, or keyword. Students should leave all book bags outside of the lab. 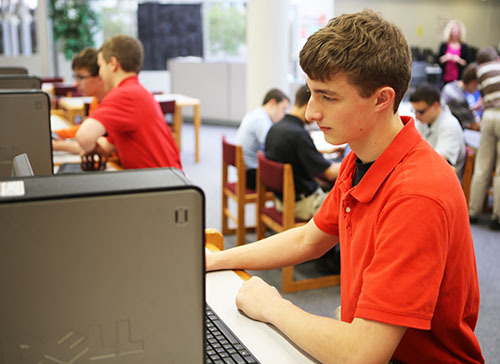 Students are never allowed to play games or use any type of messaging, such as command prompt messages, on any of the computers in the library. Students must follow all guidelines of the Internet Acceptable Use Policy as it is printed in the student handbook. Students may not print multiple copies on any of the network printers. Students may print one copy and make multiple copies on the photocopy machine for 10 cents a copy. Book Discussion Groups are available for each grade level. The various group levels meet in the Reading Loft once a month during lunch periods. All members receive a free book as well as refreshments provided by the librarian. Membership is open to all students who enjoy reading and discussing books. The Library Media Center hosts the SPHS Maker Lab, which contains two 3-D printers and two die cutters. The lab is available for students during library hours. Students may create 3-D designs using www.Tinkercad.com or 2-D designs for the die cutter using Cricut design software. Beginning workshops are regularly offered for students wishing assistance in learning the design programs. The Lost & Found is located at the circulation desk of the LMC. Students should put their name on all their books, calculators, notebooks, etc. so that the items may be claimed if lost.